April 16, 2019 Robert W.
Business window decals, stickers and signs are a sure fire method of getting your business noticed at a low price. Once business window decals, stickers and signs have been placed on the window, they will last a long time. These window signs will be viewed thousands of times and promote your business for the low cost of producing them and applying the signs to your windows. Window graphics are not terribly difficult to install and may people simply choose to apply the stickers themselves and save money. One of the most simplest window signs for businesses is the front door vinyl lettering, which usually consists of company name, hours of operation, telephone number and maybe a website address. This vinyl lettering is usually in white or yellow ( as they are the best colors that show up on glass) and if purchased at a sign shop, will cost around $30.00 for a easy to install lettering that comes in one piece. Business window decals, stickers and signs can be more elaborate. There can be printed stickers that are contour cut around the print, different color printed and lettered signs as well as window perforation. Window perforation ( or see through graphics) is a full color print that is applied to the outside of the window so that the people on the outside can only see what you have printed on the window perf. The people on the inside of the store can see out without any obstruction. This printed material is like wallpaper or tint, it can be applied by the end user. There are several You Tube videos about how to install this window perf that can be found on the internet. 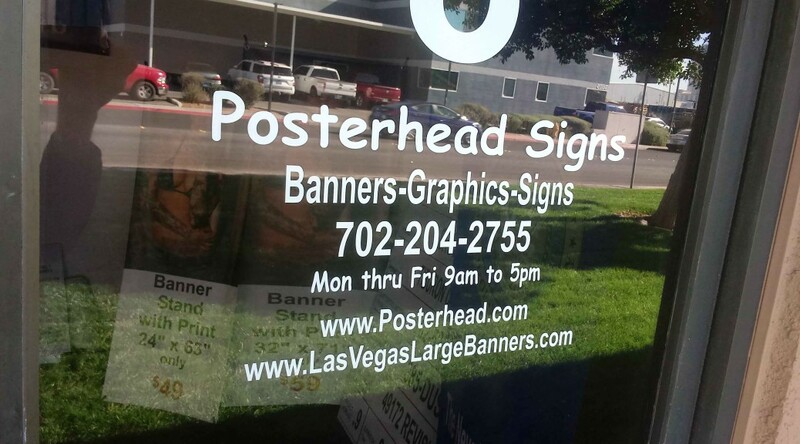 Business window decals, stickers and signs can be found at local sign stores in Vegas at very good prices. it is one of the first steps in getting your company known. Previous PostVehicle Vinyl Lettering in Las VegasNext PostVehicle Magnetic Signs For Cheap Advertisment.